Olive Uwineza is 12 years old and dreams of becoming president one day. She sits in a class of about 30 pupils, at a high-tech primary school in Kigali, Rwanda. Each student has a green, white and orange laptop that uses cartoon animations to make lessons more fun. A lover of maths and science, Olive says tackling these subjects without computers “can make my lessons difficult”. Five years ago, an initiative called One Laptop Per Child (OLPC) was introduced to the school, led by the government and NGOs. It has seen 200,000 laptops distributed in more than 400 schools across this tiny east African nation. Facilities at Olive’s school have been upgraded and modernised, with access to wi-fi, and software tailored for the curriculum. 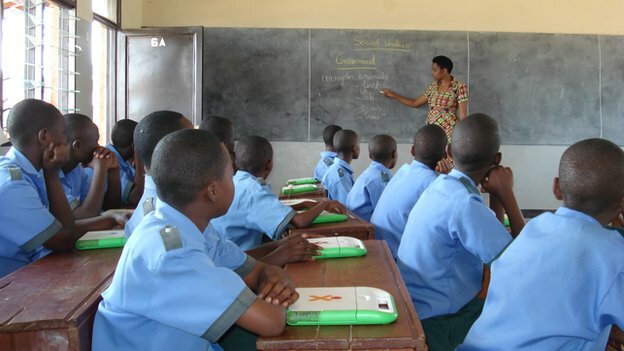 The OLPC programme is one of the pillars of Rwanda’s Vision 2020, which aims to turn the country into a knowledge-based economy similar to that of Singapore in South East Asia. In the wood-panelled halls of his official office, we meet President Paul Kagame, who has personally been a driver of this vision. He says information technology will help to turn Rwanda into a regional tech hub that will help Rwandans “find jobs, feed their children and regain their dignity”. The tragedy of the 1994 genocide is a strong motivation for President Kagame. In his view, better access to information might have helped victims and perpetrators make different political choices. For him, the IT revolution is not only about modernising the Rwandan economy – at the core, it’s about healing the nation. Mr Kagame has presided over an era of robust growth in Rwanda. Last year, the economy grew by more than 7%. Government reforms have encouraged foreign investment and the World Bank has ranked Rwanda the third best country in sub-Saharan Africa in its “Doing Business” index. A Canadian group supported and sponsored some kids and teachers in Kenya. Saima Mohsin from BBC visits this project to find out how the XO laptops are being used. Watch Horizons episode 15 part 3 “Accesible Technology” here.